Make a statement with your cookie jar. 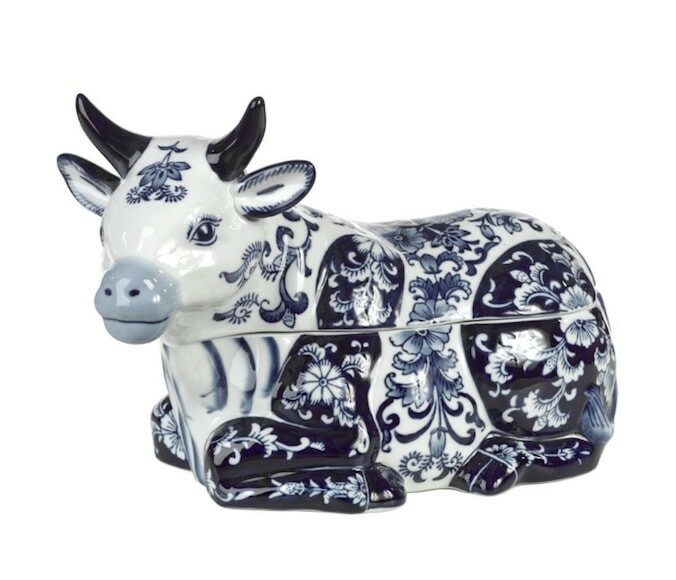 That works for sure with this large cookie jar cow of white porcelain with blue decorations – rather Dutch. This cookie jar does not belong in a cupboard but deserves a visible place in the Interior. A design of Studio PP, the own design studio of Pols Potten. Looking for something different? Found it! You can call this cookie jar a statement. No chance that this cookie cow passes unnoticed. This porcelain cookie jar has a white base tastefully decorated with blue flower and leaf motifs. Dutch design by Studio PP, the own design studio of Pols Potten. There they have given this cookie jar a generous size with a length of 33 cm and a height of 21 cm. The cookie jar cow, not an average cookie jar.